Way back in July, we inherited a smoker from one of SP's co-workers. She was moving to the west coast and couldn't take it with her, so she gave it to us. We happily accepted because, inspired by my brother's smoking, we have long wanted to try it. The problems: we rarely have enough time to devote to smoking and we didn't want to invest in something we might not enjoy, might not have the time for, and might not get to use too much since the weather plays a large role in our grilling/smoking days. Not the best photo - I had to crop my brother out. I don't think he wants his photo on the blog! 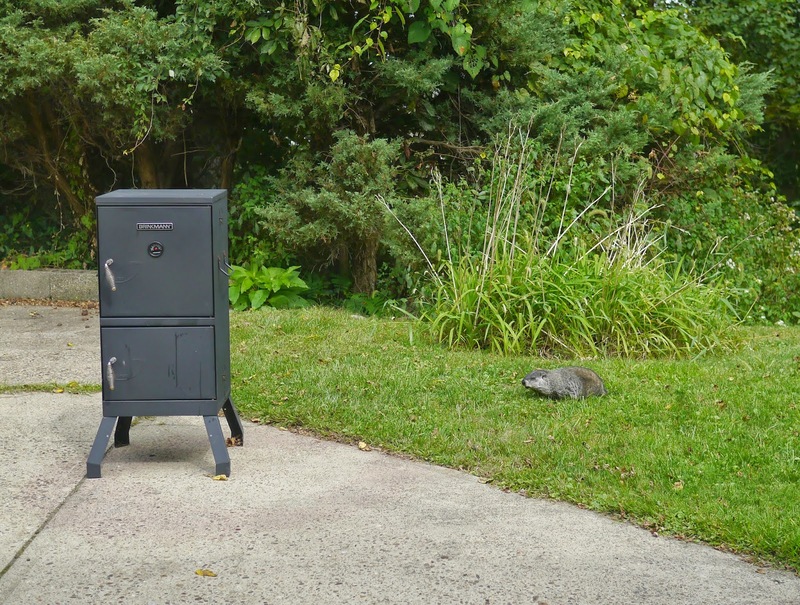 He has also built smokers / set up smoke pits for doing whole pigs. He's pretty good at this smoking thing. After cleaning the racks and buying the charcoal and wood, we were ready to experiment - and maybe fail. That's why thus far, we've only been smoking part of our meals. Long time readers know that we usually cook a lot of food on Sunday and eat the leftovers during the week. That makes weeknight meals quick and easy. We don't mind eating the same meal 2-3 times a week. Our first smoker attempt was ribs, but we smoked only a half rack. The other two half racks were slow cooked in the Dutch Oven at 225 degrees for 4 hours and finished on the grill. All of the ribs were rubbed with a store bought rub seasoning on Saturday night - we discovered that the rub really soaks in and infuses the meat if we let it sit on the meat overnight instead of rubbing the meat an hour or so before cooking it. Smoking day arrived - a lovely, warm, sunny, rain free Sunday. SP soaked the hickory wood chips. 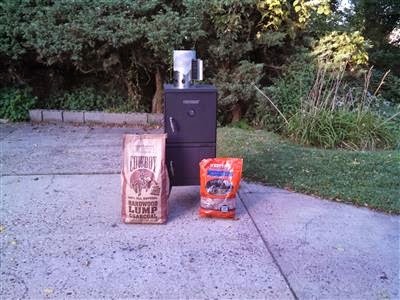 There's the chimney starter with the lump charcoal. There's the whole thing, smoking away! Yes, we smoked up the neighborhood! We used our meat thermometer to keep an eye on the air temperature in the smoker - it's not perfect, but gives us a general idea. 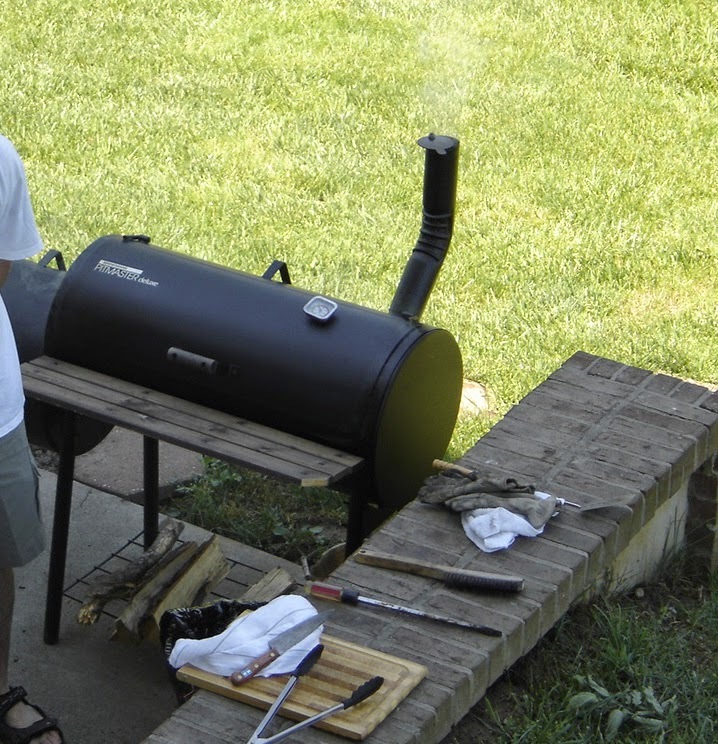 SP sets the thermometer base until on the edge of the grill and feeds the probe part through the smoker's side air vent. The ribs took about 5 hours to smoke. SP finished them on the grill, brushing on the barbecue sauce we made (the Williamsburg sauce we like so much). 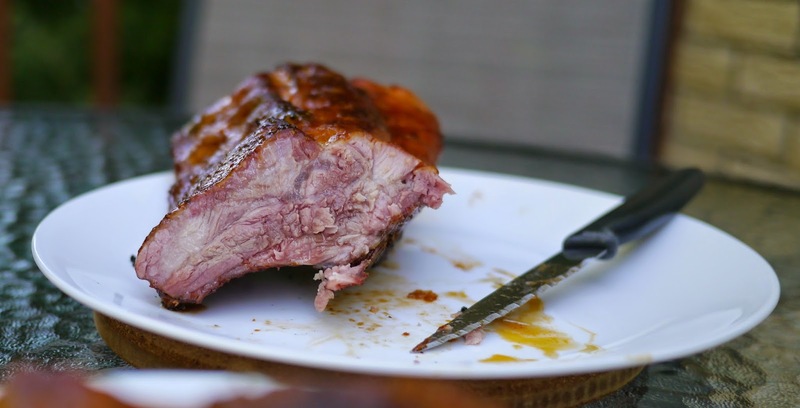 Just 5-10 minutes on the grill to get the sauce on the ribs. There isn't a super discernible smoke ring. My brother said ribs don't usually get a good smoke ring. Our smoked ribs had a great smoky taste and were still juicy inside. Our first smoking experience was a success! Next time, we would give the smoked ribs a bit longer in the smoker, just to make sure they are done. Initially we gave them 4~4.5 hours in the smoker. We weren't sure if they seemed so juicy because they were so moist from smoking low and slow or because they weren't completely done. We sampled the ends of the smoked ribs on Sunday and put the rest back in the smoker while we ate the Dutch Oven ribs for dinner. So the smoked ribs were reheated (wrapped in foil) during the week and were delicious. But next time, 5 hours in the smoker.